Cuba, Texas, Live Oak County ghost town. 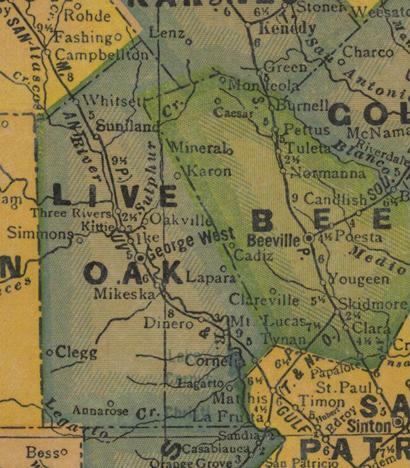 "8 or 10 miles East of the Nueces River"
The following facts and the above quote are taken from the History of Live Oak County. It is not known what the community of Cuba was called prior to 1898. That was the year the Spanish American War began (and ended). Towns all over America were renamed as a patriotic tide swept over the nation. Cuba, and Havana were, by far, the most favored names. Being a ghost town, it's now safe to discuss Cuba's less-than-saintly reputation. One particular incident highlighted in the Live Oak County history mentions a daughter-in-law breaking her wooden bucket over the head of her father-in-law at the town well. Cuban-Texans were known to be a feisty lot. Another black mark for the town came about when two soldiers who had volunteered for the "Cuban War" returned with a particular ailment called the Cuban "Itch." While it was originally contracted in official Cuba - it quickly gained a reputation in Live Oak County and its origin was transferred to the town. The third thing Cuba, Texas is noted for was baseball. Alex McKinney and R.W. Burks are credited with forming the "Cuban Nine" - a notorious baseball team.